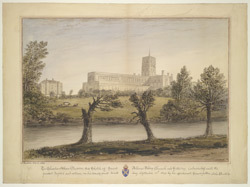 This is a watercolour of St. Albans Abbey and gatehouse seen from the river Ver. Although the site has been a place of pilgrimage for over 1,700 years, the present building was originally constructed in the 11th century. It has been re-built and refurbished at various times in its history, most significantly in the 12th and 19th century. It is vast, possessing an extremely long, romanesque-style nave. This picture was made in 1832 by John Buckler, who later gave it to Charles Alban Buckler for his 21st birthday.